In 1529 Henry VIII removed Cardinal Wolsey from Hampton Court Palace and took over possession. 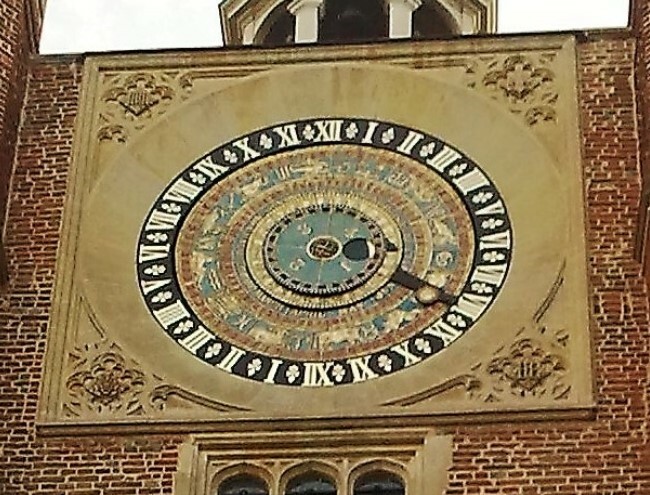 In 1540 he installed the Astrological Clock which can still be seen to this day. 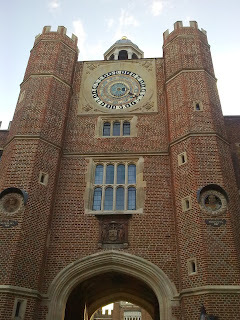 I visited Hampton Court Palace in June 2012, to see John Barrowman perform a concert in the inner courtyard. I walked under the clock arch just as William Shakespeare did back in December 1603 when he visited the palace as part of the company of the Kingsmen who provided the Christmas and New Year's entertainment for King James I. What I did not know and only learned this past weekend at the Lavenham Literary Festival was that this clock was known as the clock of doom, or the clock of death, as on the three occasions that it stopped in the past someone in the Royal household died. The clock and dials were recently restored and I am happy to report that they were working in perfect order when I walked underneath the clock in 2012.